Move aside D-company. For, here comes the B-school to manage Bollywood. When a premier business school decides to land up in the big bad world of mainstream Hindi cinema, reasons have to be compelling. In this case, some future honchos are trying to define corporate responsibility, on screen. Buddha in a Traffic Jam, a film with an unusual title to be released by the yearend, is set to create some unusual equations and trends in Bollywood. Co-produced by students of the ISB (Indian School of Business, Hyderabad, ranked 12th among the best business schools of the world) under the banner of Friday Night Productions with director Vivek Agnihotri, who is also co-producing the film, Buddha in a Traffic Jam pre-scripts social concerns and responsibilities, which future CEOs are going to confront in the real corporate world. No wonder, all 570 future business leaders studying at ISB, play a vital role in the making of the film. It all began when director Vivek Agnihotri, whose earlier films include Goal and Chocolate, was invited to teach ‘creativity’ by the ISB. In a business school environment, he could not help coming across the much-talked about ‘corporate responsibility’ and the subject triggered heated debates. "The irony of capitalism is that you can carry corporate responsibility, per se, only when you make huge profits. We may clap when corporate honchos talk about social welfare projects, we all know profits are made at the cost of keeping someone poor somewhere. When corporates go to Bastar or to Orissa with welfare programmes, how much mineral they have dug out from their land to fund it! While 70 per cent of the population lives in abject poverty, we know the reasons why entire districts turn to Naxalism and the nexus that exists behind all these nice-sounding concepts," says Vivek. The understanding for it all did not dawn upon him overnight at the premises of the business school. For a well-travelled Vivek, the questions have been nagging his small-town sensibility for many years. He hails from Bhopal and with scriptwriter Rohit Malhotra, who comes from Dehradun, another politically active town, they were able to concretise the concepts of intellectual terrorism, contemporary Naxalism and the nexus between corporate and political world, that disturbed them for years. 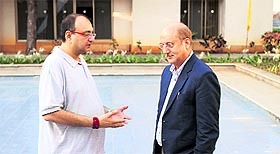 Entirely shot at ISB, the storyline revolves around Vikram Pandit, played by Arunoday Singh, a student of the Indian Institute of Business, who becomes the blue-eyed boy of Professor Jamshed Batki, played by Anupam Kher. Under the professor’s influence, Vikram starts public discourses and publishing articles under his own name that are authored by Batki. The articles, which deal with the plight of the poor, are posted on his blog as well as on Facebook. The story evolves as it mirrors the primeval agony of the deprived in India. Vikram offers a modern-day remedy — a radical business idea that can bypass all red tape and political hurdles. Gradually, veils are lifted from the faces of people around him and Vikram realises what he is up against and he must find a way out of the cesspool to save his life. The film reflects restlessness with the status quo of society, which refuses to transform itself despite several attempts at rebellion, like the JP movement, the rise and fall and resurgence of Naxalism etc. This also explains the title Buddha in a Traffic Jam. "People at B schools have no idea about the real India. It is an attempt to bring them closer to reality," adds Vivek. On their part, the students have learnt more than creative aspects of filmmaking, in the process. "Right from marketing and raising money for the film to its promotion and publicity classifies as a job of a business management student. But we were also no less in creativity. We have ideated upon the script", says Ravi Agnihotri, a student member of Friday Night Productions. film will, in some way, touch the lives of young Indians, who are very keenly anticipating a new kind of Indian cinema of purpose. I am glad that my team and students of ISB are part of this project," says Vivek, director of the film. Other members of the cast are Mahie Gill, Pallavi Joshi and Vivek Vaswani. With the recent developments of Anna Hazare’s social mobilisation against corruption, the plot of the film acquires even greater significance. Before ISB students entered film business, another management guru, Arindam Chaudhari, entered film production with The Last Lear and Do Dooni Chaar.